It will be a crazy busy night in the National Hockey League today as every team but the St. Louis Blues is in action! We’re looking forward to a ton of games to watch on TV tonight, but 15 games took a long time to handicap. The way our heads are spinning after looking at all of these matchups, we’re glad there aren’t 15 games in one night that often. Our personal bets have gone 1-1 over the last few days, losing the First Period Under 1.5 in Edmonton/St. Louis last night on a stinker allowed by Talbot and hitting the Jets Team Total Over 2.5 Monday in Nashville. We’ve been hovering around the +3/+4 unit mark on the season for a while, so hopefully tonight’s the breakout night we’ve been waiting for. The Dallas/Colorado game was a game that we’ve wrestled back and forth all day about, trying to decide whether to take the Over 6 or the Avalanche moneyline. Ultimately, we went with the Avs Team Total (albeit at a pretty steep -147 price), choosing to take Jonathan Bernier’s play out of the equation. Hopefully it was the right move. Reasons to bet Boston: The Bruins have won 2 straight games and haven’t played since Saturday. New Jersey has given up 3+ goals in 7 of its last 9 games. Reasons to bet New Jersey: The Devils are 3-1-1 in their last 5 games and have earned points in 6 of 8. Boston’s still banged up with injuries and could be without Marchand, Krug and other notable players. Reasons to bet Ottawa: The Senators are 4-1-1 on the road. Washington has lost 3 of its last 4 games, allowing 4 goals or more in each of those losses. Reasons to bet Washington: The Capitals have won 6 of the last 7 meetings and 8 of 10. Ottawa has scored just 3 goals during its 3-game losing streak and has 2 regulation time wins in its last 9. Reasons to bet Dallas: The Stars have won 5 of the last 6 meetings and 7 of 9. Colorado has allowed 3+ goals in 9 of its last 10 games. Reasons to bet Colorado: The Avalanche is 6-1-1 at home, averaging 4.63 goals per outing. Dallas is 3-7-1 on the road, where it has scored 8 regulation time goals in its last 5. Reasons to bet San Jose: The Sharks have won 4 of 6 road games this year and won’t look past Arizona as they look to snap a 3-game losing streak. The Coyotes have lost 7 of 8 at home and are playing their first home game following a 4-game eastern road trip. Reasons to bet Arizona: The Coyotes have won a season-high 3 games in a row and their power play is 5 for its last 12. San Jose has scored 5 goals in its last 4 games and 2 or less in 6 of 7. Reasons to bet Philadelphia: The Flyers have won their last 4 visits to New York and 6 of the last 7 meetings overall. New York has given up 3+ goals in 4 of its last 5 games and 7 of 9. Reasons to bet New York: The Islanders are 6-0-2 at home and haven’t played since Sunday, while Philadelphia is playing for the second straight night. The Flyers have lost 5 straight and 8 of 10. Reasons to bet Minnesota: The Wild is 4-1-1 in its last 6 games and has won 4 straight trips to Buffalo. The Sabres are 2-6-1 at home, where they are averaging 1.78 goals per game. Reasons to bet Buffalo: The Sabres nearly rallied from a 3-0 third-period deficit Monday against Columbus, appearing to score the game-tying goal late in regulation before it was overturned. Minnesota has allowed 11 goals in its last 3 games. Reasons to bet Edmonton: The Oilers’ offence may finally be waking up a bit, scoring 3+ goals in 3 of its last 4 games. Detroit blew a 3-1 third-period lead Sunday at home, losing 4-3 in overtime to Colorado. Reasons to bet Detroit: The Red Wings have earned points in 6 of their last 7 games and 8 of 10 (6-2-2). Edmonton lost 8-3 last night in St. Louis, its fifth defeat in its last 6 games. 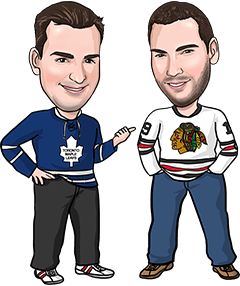 Reasons to bet Toronto: The Leafs have won 6 of their last 7 games, allowing 7 non-empty net goals during that span. Florida is playing its first home game following a 3-game western road trip and has lost 4 of 5 at home. Reasons to bet Florida: The Panthers are averaging more than 4 goals per game at home. Toronto has scored 1 goal in 2 of its last 3 games. Reasons to bet Vancouver: The Canucks are 7-3 on the road this season and beat the Penguins 4-2 earlier this month in Vancouver. Pittsburgh has just 2 regulation time wins in its last 8 games and will not have Malkin in the lineup tonight. Reasons to bet Pittsburgh: The Penguins are 6-1-1 at home, where they are allowing 2.13 goals per game. Vancouver played last night in Philadelphia while Pittsburgh has been off since Saturday. The Under is 7-2-1 in the last 10 meetings. Reasons to bet New York: The Rangers have won 7 of their last 9 games and have scored 3+ goals in 8 of their last 10. Carolina has won just 4 of its 9 home games (4-2-3). Reasons to bet Carolina: The Hurricanes are 5-1-1 in their last 7 games, scoring 3+ goals in all of those contests. New York has yet to win in regulation time on the road. Reasons to bet Calgary: The Flames have won 6 of their last 8 road games and 7 of their last 9 overall. Columbus has scored just 9 regulation time goals in its last 6 games. Reasons to bet Columbus: The Blue Jackets have won 4 straight games, allowing a total of 4 goals during the streak. Calgary has given up 3+ goals in 6 of its last 7. Reasons to bet Chicago: The Blackhawks have won 3 of their last 4 games, including a 2-1 win Saturday in Pittsburgh. Chicago has allowed just 2 power play goals in its last 8 games. Reasons to bet Tampa: The Lightning has had 3 days to stew over a 5-3 loss at home to the Islanders, when Tampa allowed the first 4 goals of the game. Chicago has lost 7 of its last 9 trips to Tampa. Reasons to bet Montreal: Excluding empty netters, the Canadiens have held 6 of their last 8 opponents to 2 goals or less, including last night’s 3-1 loss in Dallas. The Predators have allowed 3+ goals in 8 of their last 10. Reasons to bet Nashville: The Predators are 7-1-1 at home and have won 7 of their last 8 games overall. Montreal has lost 4 straight and 5 of 6, and is playing its second road game in as many nights. Reasons to bet Vegas: The Golden Knights have won 2 straight and 3 of their last 4. Anaheim is playing its 3rd game in 4 nights while Vegas has had 2 days off. Reasons to bet Anaheim: The Ducks have won 3 straight and 4 of 5, and they’ve earned points in 6 of their last 7 (4-1-2). Vegas has lost 6 of its last 8 road games. Reasons to bet Winnipeg: The Jets are 7-2-1 in their last 10 games and have suffered just 2 regulation losses in their last 14. Los Angeles has lost 5 of its last 6 games overall as well as 5 of its last 6 at home. Reasons to bet Los Angeles: The Kings have won 8 of their last 11 home games versus Winnipeg. The Jets have allowed 5 goals in 2 of their last 3 road games.